In honor of this week’s celebration of International Women’s Day, and to celebrate the whole month of March, not just as the beginning of spring but also as Women’s History Month, librarians, parents, and educators are no doubt searching for resources honoring the strength and resilience of girls and ladies, past and present. Look no further; the National Children’s Book Literacy Alliance makes the quest an easy one! 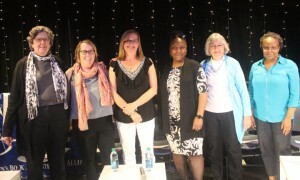 Panelists from the Author Event “Celebrating Heroines in Fact and Fiction” – Grace Greene, Jeannine Atkins, Heather Lang, Ukua Holmes, Katherine Paterson, and Rita Williams-Garcia. First, one of NCBLA’s major events this past year was a panel discussion entitled Celebrating Heroines in Fact and Fiction. What a rich resource! Within the video for the event, hear noted authors Katherine Paterson, Rita Williams-Garcia, Jeannine Atkins, and Heather Lang, along with illustrator Ekua Holmes, suggest both classic and contemporary children’s book titles perfect for inspiring girls to read, and read often! Also, discover how the books these authors read during their childhood influenced not only their writing, but, most importantly, their development as empathetic human beings. Listen to a discussion as to the literary characters these authors have unveiled, and explore how reading inspires girls to reach beyond social norms and break glass ceilings. Guide for Atkins’ nonfiction book Finding Wonder: Three Girls Who Changed Science, including discussion questions, science activities, and art exploration exercises. Guide for Katherine Paterson featuring materials regarding The Great Gilly Hopkins and The Same Stuff as Stars. Guide for Williams-Garcia’s novel P.S. Be Eleven, which includes discussion questions, interdisciplinary activities regarding topics relevant to the book (Motown, Vietnam War, and Senator Robert F. Kennedy), and a list of books for further reading. These guides contain creative, imagination-building activities and learning opportunities, and educators (public and home school) will welcome the ease of use, succinct instructions, and quality instructional materials! A final resource compiled by NCBLA as a result of the Heroine event is a Bibliography of Children’s Books About Strong Girls and Women. Utilize this listing for reading guidance purposes this month! Next, delve into women’s resources found at the NCBLA’s premiere history-based website and book, Our White House: Looking In, Looking Out. At the digital source, utilize the First Lady Fact File, a collection of detail-laden biographies on each of our first ladies, from Martha Washington to Michelle Obama. Learn about the legacy of each First Lady, and read some of their famous quotes for inspiration and guidance. Along with this file, do not miss the creative article by NCBLA’s Geri Eddins – From White House Hostess to American Power House: The Evolution of the First Lady’s Title and Role, complete with engaging critical thinking discussion questions and additional resource listings. Finally, reach for the book itself, and leaf through its pages! Find creative stories, poems, and even paper doll cut-outs revealing the work, contributions, courage, and graciousness of women who have lived and served within the halls of Our White House, i.e. 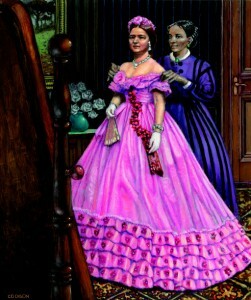 Mary Todd Lincoln and Elizabeth Keckly; Eleanor Roosevelt; Dolley Madison; Frances Cleveland; Alice Paul; Lynda Johnson Robb; Jacqueline Kennedy; and Laura Bush! Model these courageous women and dive deep into these rich educational offerings this month to widen the smiles and open the curiosity and imagination of girls (and boys) across our great land!